I really wasn't sure if I was going to like this book when I first got it. I'm feeling a little burnt out on thrillers and was hoping this one would be enough to catch my attention. Luckily, once I started it, I couldn't put it down and consumed it in one sitting. I am back with another review, today it is Three Days Missing by Kimberly Blake. Thanks so much to BookSparks for sending me a copy of this book as part of #SRC2018 for an honest review, as always, all opinions are my own. This story follows Kat, a newly-separated mother whose whole world revolves around her eight-year-old son, Ethan. When he goes away on an overnight camping field trip with his class, she is apprehensive but allows him to go anyways. 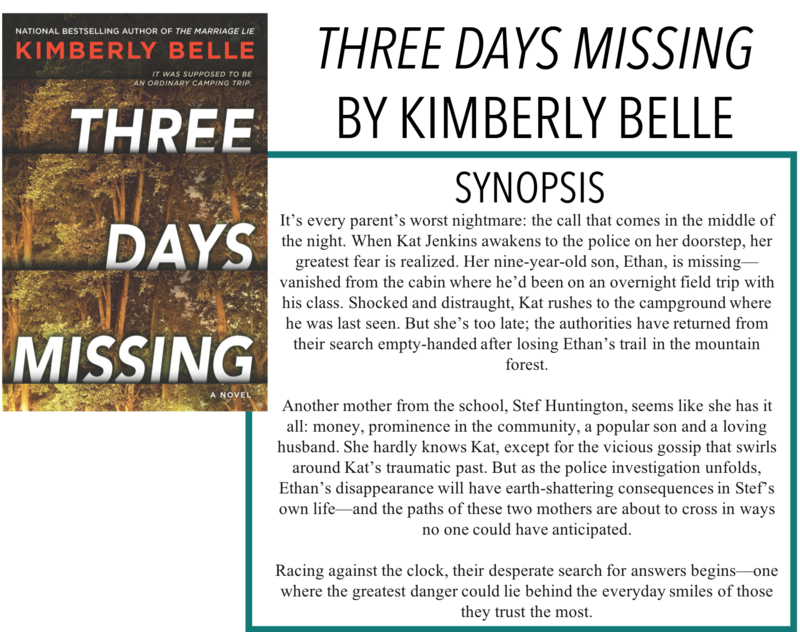 Everything is fine until she is awoken in the middle of the night to a policeman on her doorstep telling her that Ethan is missing, that he might have been taken, from the camp. Across town, the mayor of Atlanta and his wife, Stef, who have a child on the trip as well, get ready for a PR nightmare. Stef doesn't know Kat, but for a moment, she realizes it could have been her child that went missing. She vows to stop at nothing to find the boy, even if it means airing some dirty laundry of her own. I think I would call this more of a suspense novel than a thriller if we really want to split hairs. I actually had a few theories on the go when we got enough clues to figure out what happened. But that didn't necessarily take away from the story because despite having an idea of what happened to Ethan, there was still the question of why. This aspect was more of a waiting game and had me flying through the last few chapters to get to the ending. This was more of a plot-driven novel, which I usually prefer over character driven ones. The characters in this book were generally decent if a bit stereotypical. There's the distraught mother, the abusive, alcoholic father, the knight in shining armour detective. Luckily, we didn't get any of the usual romance that comes with this sort of set up. I didn't hate the characters, I just don't know that they are that memorable. You could stick any other person in those roles, and it would still be the same story. BUT, I was perfectly okay with this because I was so focused on the story itself and not the characters. I think that I need to pick up more of Belle's work, even though this is the first book of hers that I've read. She completely hooked me from the very beginning and it's been a long time since I didn't want to take a break from reading to do something else. Overall, I really enjoyed this take on a domestic suspense story and am looking forward to more from Belle!